Modern roofing materials are designed to protect your home from wet and damaging weather. When installed with upgrades like insulation, a cool roof has the added benefit of boosting your home's energy efficiency, providing you savings on mechanical heating and cooling costs. Though the rainy season is still a few months away, now is a good time to consider upgrading your roof. By using our Property Assessed Clean Energy (PACE) financing, an energy efficient roof is more financially possible than ever before. With El Niño on the way, meteorologists across California are predicting a wet winter. Above average chances of rain are predicted in the state, particularly in Southern California. Rather than waiting until your roof springs a leak, consider replacing your roof for $0 down with a fully-financed, efficient roof from one of our professional contractors. At CaliforniaFIRST, we offer innovative financing for cool roofs and performance roofs. Rather than asphalt shingles or other traditional roofing materials, cool roofs are made with highly reflective materials (like light-colored tiles). These materials reflect the sun that shines on your roof, reducing the amount of heat that is absorbed by your roof and transmitted into your attic and ultimately into the living spaces of your home. Measured by their "solar reflectance" (SR), cool roofs help to literally keep your home cool during the hottest times of the year. The surface temperature of the roof itself can be reduced by up to 50_лјF with a cool roof. 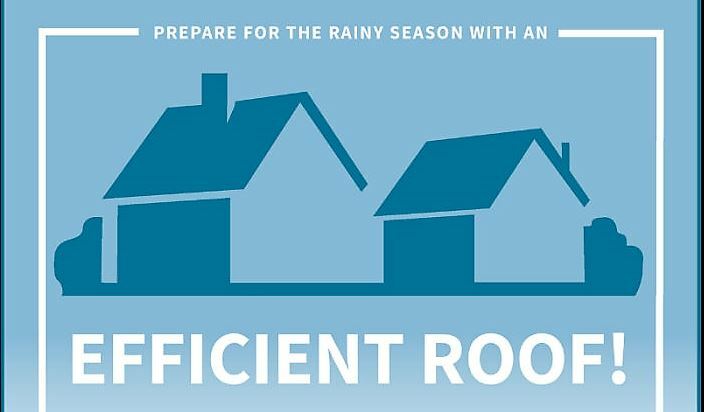 A new roof will help prevent home damage and discomfort during the rainy season; a prescriptive cool roof has the added benefit of reducing air conditioning costs by up to 15% during peak cooling season. A "performance roof" refers to any roof (made of any material) that is paired with a home efficiency product that aids in reducing the transfer of heat. These home efficiency products and services can vary. Your roof can qualify for CaliforniaFIRST financing when paired with measures like installing proper attic insulation, sealing and insulating your home's ductwork, installing a radiant barrier in your attic, and much more (the specifications for a performance roof can be found here). Performance roofs are designed to ease the work of your HVAC (heating, cooling, ventilation, and air conditioning) systems by cutting down on heat transfer. By implementing various measures to stop the cold or hot outside air from entering your attic (or at least keep it out of your living area), you can expect to save on energy bills. If you're considering a new roof, consider a CaliforniaFIRST-financed cool roof. We'll provide 100% upfront financing for the installation costs and help pair you with a reputable contractor in your area. A new roof may also increase the value of your home! As thousands of happy homeowners can attest, their home efficiency upgrades are helping them save significantly on utility bills, boost comfort in their homes, and more. Get in touch with us or start by checking your eligibility for our financing to learn more about how a new roof can get you ready for the season ahead. Why pay more for efficient equipment?